AROKIA DASS has been an active trade unionist for most of his life. He is the author of Not Beyond Repair (Asia Monitor Resource Centre, Hong Kong: 1991); an historical and analytical overview of the Malaysian labour movement uncovering its origins and evolution. Dass was imprisoned for fifteen months under the infamous Internal Security Act following sweeping arrests in 1987 and subsequently released without charge. He was for many years a leader of the Transport Equipment and Allied Industries Employees Union and is now engaged in worker education projects. B. Skanthakumar spoke to Arokia Dass in August 1996 in Kuala Lumpur, Malaysia. What are the origins of the trade union movement in Malaysia? The contemporary trade union movement mainly consists of the Malaysian Trades Union Congress (MTUC) initially called the Malaysian Trades Union Council. It was formed in the early 1950s in line with the colonial strategy to negate the progressive trade union movement then in existence. The purpose of the MTUC was to co-opt a group of trade union leaders and form the Council on an anti-Communist ideological basis. The move was spear-headed by John Brazier who was attached to the Ministry of Labour and a former British Trades Union Congress official sent to Malaya (as is then was) to smash the existing trade union movement. The background to this is the anti-colonial struggle which was led by progressive forces including the Malayan Communist Party and trade unionists outside later MTUC circles. This movement was forced to go underground and then crushed during the ‘Emergency’ period (1948-1960). In its place to give a semblance of trade union representation in the state legislature, Brazier wanted English-speaking unionists to be co-opted into his sphere of influence which happened with the formation of the MTUC in 1950. The MTUC though acting as a trade union centre is not recognised as such by law but has been registered under the Societies Act and is unable to function as a genuine trade union centre. One of the conditions behind the formation of the MTUC was to ensure that it did not participate in strikes; this being a weapon of the working class. Prior to the Emergency period the unions were influenced by the Communist Party and were General Unions catering to all working people instead of being divided as at present along craft and skills lines. This was a good start to the working class movement because of the lack of development of industries: especially so because the plantation industry was the country’s main revenue earner and very important to the colonial government’s accumulation strategy. At that point the plantation movement was left wing and took up not only economic questions but also social issues affecting the migrant workers then principally from India and China. The colonialists contained the workers on estates not allowing them to develop links with other sections of the working class. They also diverted the Chinese workers by addicting them to opium smoking and likewise Indians to toddy (an alcoholic palm drink). Conditions on plantations were very bad to the extent that the trade union movement grew stronger because of the real objective conditions there. What about the present union movement especially the Malaysian Trades Union Congress? The unions formed by the British after smashing the progressive movement still linger on. In the vacuum left by the arrest and deportation of left wing trade unionists, the co-opted leaders stepped in and their influence remains strong today. Another mechanism used by the colonialists was to make union recognition consequent upon registration with state authorities principally the then office of the Registrar of Trades Unions. Thus the state could allow or disallow unions on the basis of its own designs. The leading Federation of unions was under the influence of leftists and had 300 000 members. It was to be expected that the Pan-Malayan Federation of Trades Unions (PMFTU) was not registered. To this day, unions have to conform to regulations decreed by the Director-General of trade unions under the 1959 Trade Unions Act. When the MTUC was formed the leaders were more interested in claiming to represent Labour in the legislature than in organising workers in the emerging industries. Some of these union bureaucrats believed unions should go into business forming enterprises . These businesses have all collapsed because these union leaders wanted a career for themselves as Directors of corporate bodies. Unions are very bureaucratised. General Secretaries of unions can decide on any matter without going to the membership. They can invest in buildings and then sell them or take kickbacks for renting them out to particular individuals or concerns. The biggest union today the National Union of Plantation Workers which owned its own union office and even built a hostel for students from the estates to live in when they came to the city, has sold those properties, and the monies used to pay off the debts and wages of the bureaucracy. Instead of investing membership subscriptions on ill-thought out schemes, they could have spent these huge sums on educating and training shop floor workers about democratic trade unionism and participating in the affairs of their union and the movement. What then accounts for the tensions and conflicts that have emerged in recent years between the MTUC and the Malaysian Government? Well in the late 1950s and 1960s some of these leaders participated in elections on the Labour Party ticket. The Government was unhappy with what they regarded as union involvement in politics. As industrial development gathered pace, the Government passed legislation like the 1967 Industrial Relations Act to curb the trade union movement. This was not because the trade union movement was militant or for that matter democratic. It was just that the State could not stand working class interests being represented. They wanted a free hand to carry out the ‘New Economic Policy’ which was introduced after communal tensions exploded in May 1969. This dissatisfaction with the MTUC has continued in the 1990s with the formation of the Malaysian Labour Organisation with the blessings of the Government because at that point some MTUC leaders were voicing discontent internationally at the refusal of the state to allow the formation of a National Union of Electronics Workers. There were also disputes between the two organisations over which one ought to represent workers interests on tripartite bodies like the Employment Provident Fund (EPF) Board and on international bodies such as the International Labour Organisation. The Government nominated the MLO rather than the more representative MTUC. How do you explain the recent decision of the MLO to dissolve itself and to join the MTUC? The existence of the MLO and its close relationship with the Government began to embarrass all involved because abroad the MTUC had supporters in the international trade secretariats and even in the ILO who raised the issue of proper representation of workers. Locally MLO leaders came out openly in support of employers interests for example when it opposed the raising of the employers EPF levy from 10 per cent to 12 per cent. This cast them in bad light. The Minister for Human Resources, Lim Ah Lek, has been the mid-wife of the unification of the two labour centres – the pro-government MLO and the apolitical MTUC. My own view is that this move will shift the entire labour movement to the right, making it more conservative than before. The union leadership will be pro-government and whatever semblance of independence it had will disappear making the MTUC yes-men for the Government. There is so much corruption within both these organisations that the Government can use the information it has to keep the leadership in line. 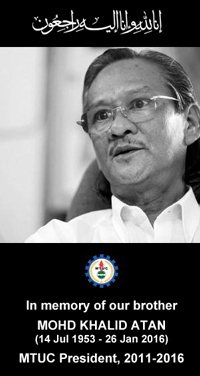 The current President of the MTUC, Zainal Rampak has corruption charges pending against him in the courts of law. This is a card the Government is holding against him. Instead of prosecuting him recent statements suggest that Rampak will be let off the hook if he repays the embezzled sums. All these practices and moves are part of the attempt to negate democratic trade unionism and to render the movement subservient to Capital and the State. The economy has been booming and the official labour leadership has declared its support and participation in Prime Minister Mahathir Mohammad’s Vision 2020 scheme of making Malaysia a fully developed nation by 2020 AD. On the economic front there is a growth rate of 8 per cent per annum sometimes 10 per cent but how are the workers benefiting from it? Even with this growth rate the Government wants to further curtail basic labour standards. The Government has come up with this concept of ‘Malaysia Inc.’, of unions being social partners along with State and Capital. How can labour be a partner when it doesn’t have equal rights and is repressed through laws like the Internal Security Act, Trade Unions Act, Industrial Relations Act, Police Act which curb the development of an independent democratic trade union movement? The working class needs to be freed of these laws and the system that underpins it before there can be genuine development of this country. Another ruse of the government to stifle an independent movement was the formation of enterprise or in-house unions modelled on Japan under the Prime Minister’s ‘Look East’ policy of basing economic development on the Japanese and East Asian experience instead of according to western prescriptions. The majority of the trade unions (around 55 per cent now) in Malaysia are in-house unions formed by employers. Some of the unionists involved are genuinely interested in their members’ welfare but are frustrated by their lack of experience and isolation from the rest of the movement. The MTUC is not addressing this real need for its services. The frustration of attempts to unionise electronics workers mainly in foreign owned factories in Free Trade Zones and other places has been an issue raised internationally by labour activists. Malaysia is the world’s largest exporter of semi-conductors and there are 200 000 workers in the electronics industry. There has been no transfer of technology in these industries and there was an assurance given to the investors that unions would not be formed there. There have been attempts over the last twenty years by workers in these factories to organise themselves into in-house unions but they have all been smashed. A celebrated case is that of the RCA Harriss Workers Union but these unionists have now won their industrial court action and will be reporting back for work on October 1st and will begin their unionisation drive again. The government calls industries like these “sunset” ones because they have outlived their usefulness in assembly and the new policy is to prioritise hi-tech. When this happens there will be further objections to the formation of unions. What is interesting here is that the MTUC knows that the Government will not approve registration of a National Union of Electronics Workers, but they harp on this demand. As a concession the Government has conceded the possibility of forming state based unions . But the MTUC has not pursued this option. For example there are 200 000 workers in the textiles industry and when there were moves to form a state based union, the MTUC objected strongly. What the MTUC ought to be doing is to first organise workers on this basis and later form a national federation of such unions. The MTUC rationale is that in house unions are not effective. Of course they are not effective because they are employer based but in the RCA Harris case, with good leadership we found that they could sustain a struggle for recognition over six years. This is something remarkable given the kind of conditions we are living in. So we should evaluate this question of in house unions on a case by case basis rather than adopting a general policy. Malaysia is a society where ethnic politics and identity  determine virtually every aspect of life and even has an institutionalised role, how has the multi-ethnic labour movement fared? We have in Malaysia today a young Malay working class, men and women, who in some instances are 70 – 80% of the workforce, whereas we find the leadership particularly in the private sector is largely of Indian origin. This gives the employer and the government the possibility of using ethnic divisions and tensions to criticise the Malay workers for following Indians who are labelled as trouble makers. Of course Indians are not inherently trouble makers but it is by virtue of their location in production and in the plantation industry, that the trade union movement is dominated by those of Indian descent. This is also a reflection of historical factors including the struggles of the Indian working class. In our society ethnic politics and tensions rears its ugly head every time it suits the purposes of those in power. However the very fact that Indians are elected by Malay workers to represent them shows that ethnicity is not always a barrier to workers unity. The labour movement is the only part of Malaysian society where ethnic politics is not the determining consideration. And the hope for us to build a unified country not through legislation but through struggle is the trade union movement. That is why we need to build a movement that is independent of State, employers and political parties so that it will be free to articulate the best interests of the working class. In 1994 in the run up to elections for the MTUC executive, workers from the public and private sectors committed to democratic practices and the vision I have outlined above, combined to form a group called the ‘Third Force’. This group won most posts excepting the most powerful ones, those of President and General Secretary, which were only narrowly lost. Now with this new merger of the union federations, the balance of power will shift to the right wing. However the ‘Third Force’ is committed to putting up a fight. A recent and observable trend is the reliance upon and importance of migrant workers to the Malaysian economy but the preoccupation of trade union leaders is to demand that the Government keep out ‘illegal’ workers! This is a very important issue which the MTUC has not responded to appropriately. There are an estimated two million migrant workers largely from neighbouring South-East-Asian countries like Indonesia and domestics from the Philippines but also from Bangladesh. Initially these workers came to do low wage, casual jobs like toiling on the plantations and in the construction industry and of course the informal economy. However they are now shifting to manufacturing. When there was a shortage of labour in the late 1980s and early 1990’s, the trade union movement should have demanded labour rights including better wages and working conditions but they missed this opportunity . With the widespread use of migrant workers, salaries have become depressed. There is friction between local and foreign workers, because one of the conditions of employment of migrant workers is the provision of housing by their employers, which local workers have denied to them. Companies rent low cost housing for migrant employees depriving local workers of this limited housing stock and forcing them to rent private accommodation at an exorbitant rate. Now this is a social question and should be approached as such. We welcome migrant workers into this country but at the same time they should be unionised, should receive the same benefits as locals and the particular problems they face should be addressed. This is a problem that is growing to explosive proportions. Migrant workers arrive in Malaysia in debt to the contractor or the labour agent to the tune of M$5 000. And they are made to work more than 12 hours a day including overtime to repay this debt. However productivity decreases because most of these workers particularly those from Bangladesh come from rural areas with no experience of industrial work and without the same skills. They are not trained and because of unsafe machinery and bad working conditions there are a high number of injuries and even deaths among these workers. The fact that many are illegal and still enter the country shows that the employers want them. Sending them back is unfair. 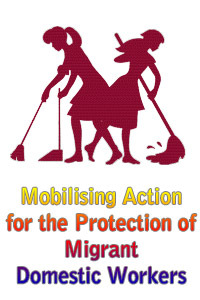 The progressive solution is to treat migrant workers as local workers and local workers as migrant workers! There is no law preventing migrant workers from being unionised, they aren’t allowed to hold office but they can be organised. Many Bangladeshi workers come with a history of struggle and are militant; it is unsurprising they don’t want to join a passive union movement. But the MTUC has not made any effort to unionise them. It isn’t the migrant workers who fear the MTUC, it is the other way about! What then is the future of the trade union movement in Malaysia? This is the question upper-most in my mind over the last ten years. We are at a cross-roads. Whether the labour movement can live out the dreams and aspirations that the early unions and their leaders had for it and sacrificed their energies and lives for or whether it will simply become an adjunct of the State. Unless the remnants of the progressive trade union movement can win leadership of the movement while nurturing democratic tendencies within the unions removing the corrupt undemocratic leaders, we face a bleak future. In Malaysia the rank and file members are quite militant in their demands but they receive little support from their leaders. We need the political will to regenerate the union movement. The National Union of Bank Employees recently sold its head-office building and has earmarked half the proceeds to develop an eco-tourist theme park. Other Unions are involved in real estate deals with land developers. Ethnic composition is estimated at 60% Malay and indigenous peoples; 27% Chinese and 8% Indian and the remainder being smaller communities. The main constituents in the Barisan Nasional (National Front) coalition which has ruled since decolonisation in 1957 are ethnic Malay, Chinese and Indian parties. Ethnic quotas in favour of Malays are government policy. * A version of this interview appeared in International Viewpoint (Paris), No. 288 (May 1997), pp. 15-17.